First came love. Then came marriage. Then came life in a strange new land, and farewell to everything familiar. Most GI war brides wouldn’t have traded it for the world. Seventeen-year-old Londoner Ellen Bailey was working in a post office in the fall of 1943 when Lloyd Kern, a 20-year-old staff sergeant with the US Eighth Air Force, walked in one day. He was stationed outside London, and Ellen says she thought "he seemed like a nice guy." When he came back another day and asked her to have lunch with him, she was torn. "I always went to lunch with one of the other girls," she says. "There were four of us working at the post office, and we took turns going to lunch in pairs. I told him I was having lunch with Nora, and he said, 'She can come along.' So we began walking to Trafalgar Square, which was just a few blocks away. Nora suddenly left us on our way to lunch because she knew Lloyd wanted to be with me." That simple lunch in 1943 launched Ellen on a great adventure that culminated in her leaving home and family to make a new life in America. Ellen joined a million other English, European, and Asian women who married US servicemen. She became a war bride. Precise totals are hard to determine, but between the years 1942 and 1952, about one million American soldiers married foreign women from 50 different countries. As many as 100,000 war brides were British, 150,000 to 200,000 hailed from continental Europe, and another 16,000 came from Australia and New Zealand. There were brides from non-Allied countries, too. Military estimates indicate that 50,000 to 100,000 servicemen wed women from countries of the Far East, including Japan, and immigration records show that by 1950, 14,175 German brides of American servicemen had entered the United States. It's easy to imagine that young men experiencing lengthy deployments overseas would turn to available females for companionship. But what made so many foreign women enter relationships with American soldiers when their families and communities often disapproved of such unions? Their decisions often came down to proximity, opportunity, and generosity, or some combination of the three. To the women of war-ravaged Britain, American GIs were like a breath of fresh air, and nothing was going to stop them from filling their lungs. The soldiers' carefree, happy-go-lucky demeanor turned many a female head. Throw in the food, chocolate, cigarettes, and stockings the soldiers shared with the destitute citizens, and it's easy to see why so many young women gladly pledged their troth to them. Ellen Bailey was fortunate. Although many British women who dated American servicemen were branded as traitors to their own countrymen, Ellen's parents felt otherwise. "My father and mother were very open-minded" about dating American soldiers, she says. "A lot of people I knew didn't want girls to date Yanks." Uncle Sam shared this sentiment. The US military actively discouraged servicemen from marrying, believing family responsibilities would be a distraction. In fact, the military imposed many restrictions on marriages between servicemen and foreign women, mostly in vain. Back home, too, some American civilians decried the trend. There were those who defended the soldiers' right to marry whomever they wished, but others--especially single American women--were distressed at the idea of all those US troops bringing home foreign brides. Ellen and Lloyd's relationship almost ended before it began. Lloyd, a turret gunner on B-17 bombers, was participating in his last bombing mission over Germany in April 18, 1944, when his plane was hit by enemy fire. The pilot managed to crash-land in a field, and the 10 crew members split up and headed in separate directions. German patrols picked up eight of them the same day, but Lloyd and another crewman evaded capture for almost a week. When they were finally caught, they were sent to Krems, Austria, and imprisoned at Stalag 17-B, which later would serve as the setting for the 1953 movie Stalag 17 and the 1960s television comedy Hogan's Heroes. Ellen corresponded with Lloyd the entire time he was imprisoned, until he was freed more than a year later when the Allies entered Austria. Scheduled to return to the United States, Lloyd decided he had business to take care of first. "When he was released, he came to London instead of going back to the States," Ellen says. "He asked my parents if he could marry me and my father said, 'Talk to the boss,' meaning my mother. My mother said, 'I married who I wanted.' And that was that." Ellen and Lloyd married June 16, 1945, in London. Lloyd returned to the United States and began a nine-month wait for permission for Ellen to join him, during which time Lloyd was discharged from the military. Ellen and Lloyd were finally reunited in America in April 1946, and settled in Lloyd's Pennsylvania hometown. If British women saw American soldiers as a breath of fresh air, the liberated people of continental Europe saw them as nothing short of heroes. Everywhere American troops went as they swept through Europe in 1944, citizens rolled out the red carpet. Friendship with the Americans was not only accepted but encouraged, although parents did have concerns about their daughters marrying the ingratiating foreigners. Annette Berman was a 20-year-old university student in September 1944 when she met her future husband, Arthur Berman, outside a Paris synagogue. Just 15 years old when the war started in Europe, Annette had spent two years in hiding with her Jewish family during the German occupation of France and then had worked with the French Resistance. The liberation of Europe was a kind of liberation for her as well. Annette's first impression of American soldiers was, "They were so handsome, clean, and had lovely teeth, but they didn't speak French." It was Annette's knowledge of English that precipitated her encounter with Arthur. "He was trying to have a conversation with my father, but my father didn't speak English," she says. "I did, so I approached my father and asked if I could help." That was the first of many encounters. "Arthur was stationed outside of Paris and had leave every Saturday for two months," Annette recalls. "He would pick me up at university, and we would walk to my parents' apartment for lunch. We couldn't go out to eat because you needed coupons to do that. After lunch I would show him Paris. I took him to all the museums. Then, in December, he suddenly disappeared." Arthur's unit had moved east to the Ardennes to participate in what became known as the Battle of the Bulge. He wrote to Annette from there and had his sisters in Middletown, Pennsylvania, write, too. When he finally returned to Paris, he proposed. Shortly thereafter, Arthur's mother died and he returned home on leave. While he was in Pennsylvania, the war ended in Europe and he was discharged. Annette traveled to the United States as his fiancée, and the first thing she said to him when he met her at her plane in New York was, "My mother made me promise that I would get married right away." Five days later, they took their vows in Harrisburg, Pennsylvania. Annette's family liked Arthur, but they weren't too happy about their daughter living in America. "They thought they'd never see me again," Annette says. That was a common refrain of parents of war brides. Many of the women who married US servicemen say that leaving their families was the hardest part of the decision--even harder than traveling to a strange country. At the same time, many of the brides' families believed their daughters would have greater opportunities in America than they would have in the war-torn countries they were leaving. The war brides hungered for those opportunities, too, but, even more, they wanted to raise children in a place without the constant threat of war. That promise of peace and safety was also attractive to women of conquered hostile countries. But for these women--branded as former enemies because of their nationalities--winning acceptance as American war brides was much more difficult. After entering Germany, American soldiers were discouraged from fraternizing with German citizens and were often reminded that Germany was a defeated enemy nation, not a liberated country. But because the military required so many civilian employees, contact between soldiers and civilians in occupied Germany and Austria was common. German nationalists did not approve of their country's women socializing with Americans, and women who did socialize were ostracized, which only forced them to interact all the more with Americans. Servicemen almost universally ignored the non-fraternization policy, but they couldn't ignore the ban on marriage with German women. Some Germans married US servicemen in secret, while others gave birth to illegitimate children. The ban was officially lifted in December 1946, but the military continued to place restrictions on such unions, including a three-month waiting period and a careful screening of the German fiancée before marriage. Many in the military, as well as in the American public, remained opposed to these marriages. It wasn't just German women the soldiers were meeting in Germany, however. When the Allies liberated Germany in 1945, nine and a half million slave laborers, prisoners, and concentration camp survivors from several European nations were set free. Zora Walsh was one of those many displaced people when she met her future husband, Joe Walsh, in Germany. She and her family were Serbs who had been rounded up and sent to a forced-labor camp in Germany when the Germans invaded Yugoslavia. To avoid mandatory repatriation to a now Communist Yugoslavia, they made their way to the American zone in Munich, where Zora got a job at a Red Cross service club. It was there that she met Joe, and they began dating. "My mother liked him," Zora says. "He was decent and he loved me. She was happy to see me with him. He would jokingly say, 'I'm going to marry you.' I had heard lots of soldiers say that to girls, and I told him, 'I don't want to hear any more.'" But marry her he did, in Bomberg, Germany, on March 29, 1946. Because the ban on marriage with German women was still in effect, Zora had to provide a birth certificate to prove she wasn't German. Joe accepted additional duty in Germany so he could insure that his new wife and her parents--and her dog--got off safely to the United States. In July 1946, Zora embarked on a nine-day ocean voyage to America. That December, her mother and stepfather joined her in America. Finally, when his term of service was up, Joe returned to the States and Zora. American military personnel in occupied Japan faced rules similar to those in Germany regarding relations with the former enemy. While fraternizing with Japanese citizens was not officially banned, contact with them was restricted. But, as in Germany, the US military was the largest--and sometimes only source of employment for the Japanese, so contact was inevitable. The Japanese defeat prompted an abrupt change in the country's women. Ancient laws and traditions went out the window along with the belief in Japanese superiority. After eight months of American occupation, young Japanese women were wearing high heels and Western clothes. And even as the Japanese press portrayed Americans as "murdering devils," the servicemen's friendliness and generosity was a welcome change from the domineering aloofness of the average Japanese male of the time. Relationships with Japanese women faced the additional stumbling block of racial bias from both sides--much like the prejudice African American servicemen encountered when they tried to date and marry white foreign women in Europe and elsewhere. Americans showed a general intolerance toward Asians, seeing them as somehow tainted, while Japanese didn't accept sons-in-law of different races because they wanted to preserve their pure bloodline. Nevertheless, up to 100,000 American servicemen married women in the Far East. Carrying foreign women was one thing; getting them into America was another. 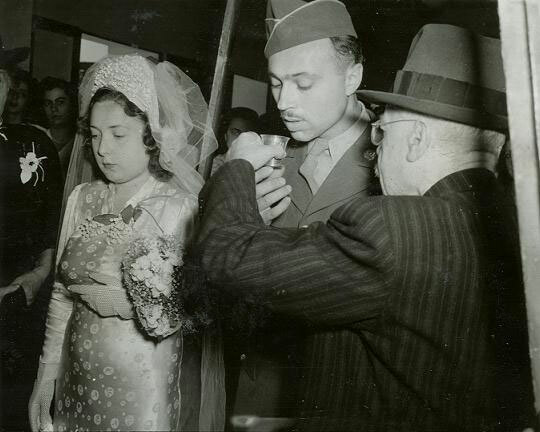 In addition to the military restrictions on marrying, immigration laws often delayed marriages and entry into the United States, so some war brides or fiancées did not join their men for many years after their engagements or marriages. Those who tried to enter the United States without proper military sponsorship could be sent back home. The immigration laws of the United States prohibited the admission of foreigners who were ineligible for citizenship (primarily Asians) and limited the entry of immigrant aliens to 150,000 per year. War brides who could not enter the country due to the immigration quotas were stuck in their home countries without their husbands and often with babies or young children. In an effort to resolve the situation, the US Congress passed Public Law 271, the War Brides Act, in 1945. The act facilitated entrance to the United States for alien wives (or husbands), and minor children of US citizens who had been in active service during World War II, by granting them non-quota status. So, even if 150,000 immigrants had already entered the United States in a given year, they would still be accepted. The act remained in effect for three years. Six months later, Congress enacted Public Law 471, the Fiancées Act, which granted fiancées of US servicemen three-month visas as temporary visitors. If a couple did not wed during that three-month period, the fiancée would be returned home. Most of the war brides traveled to the United States on former troop or hospital ships. The first arrivals of war brides in 1946 were met with great excitement by the press and the American public, though there were still those who resented foreign women who had "stolen our boys." Americans gave Ellen an overwhelmingly positive reception. "They seemed to be fascinated by my accent," she says. "I would walk up to a little grocery store about three blocks away, and people would say to me, 'Say something.' I'd reply, 'Like what?'" To this day, people still ask whether she's visiting, or even more amusing, whether she's English. "Lloyd gets a kick out of telling people, 'No, she's from Ethiopia,'" Ellen says with a laugh. Annette Berman arrived in New York on April 27, 1946. She, too, was treated kindly by everyone she met. "I was amazed at how friendly they were," Annette says. The hardest part, she continues, was getting used to calling people by their first names, particularly if they were her elders. "And people didn't shake hands much like they did at home," she says. "I never knew what to do with my hands." Because she had completed a master's degree before coming to America, Annette was able to get a job teaching French, which she did for more than two decades. She says one of the best things about marrying Arthur and coming to America was that she was able to help her parents, who had next to nothing after the war. "I sent them food," she says. "It took a long time for France to recover." After Zora Walsh came to America in 1946, she became something of a celebrity, appearing on television with other war brides and talking about her experience. She and Joe eventually ended up in Hershey, Pennsylvania, where Zora worked in a large gift shop that sold Hershey chocolate and souvenirs. She says she never felt like an outsider and always held Americans in high regard, particularly the soldiers who liberated Europe. "When I look at the kinds of wars we have now, with the embarrassment at prisons, I don't remember anything like that," she says. "The soldiers were so good to us. They would share whatever they had. That's one thing about America. You're not being judged--who you are, where you're from. That's what I respect." Not all of the war brides had pleasant experiences. Some had rude awakenings when the palatial homes described by their GI husbands turned out to be farms with no electricity or indoor plumbing. Others found themselves trapped in abusive marriages they were afraid to leave for fear that they would lose their children. But for the most part, the war brides adjusted well to their new lives and adopted country. Some kept in touch with family back home through organizations such as the Transatlantic Brides and Parents Association, which was formed overseas to help parents of war brides arrange air travel to visit children in America, but which also had branches in the United States for the brides to gather and support one another. Most war brides blended so seamlessly into the fabric of American life that, after a time, interest in them waned and they became simply Americans. Because the United States is a country of mostly immigrants and descendants of immigrants, the war brides were in good company. Ellen Kern was always amused when people asked her, "Do you like it here?" Her stock reply seems to speak for most of the war brides: "If I didn't like it here, I would have gone home." Brenda Wilt has been an associate editor for Pennsylvania Township News and an assistant editor of Civil War Times. Elfrieda Berthiaume Shukert's and Barbara Smith Scibetta's book War Brides of World War II (Presidio Press, 1988) provided her with valuable background for this article, which originally appeared in the August 2005 issue of America in WWII. Order a copy of this issue now. 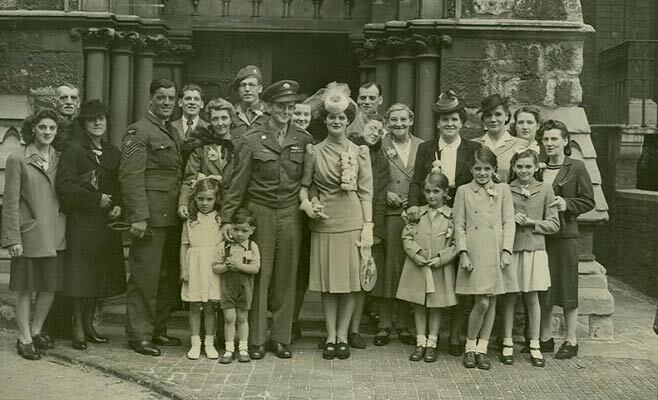 Top photo: Lloyd and Ellen Kern with Ellen's family after their wedding at St. Matthew's Church, Southwark, London, on June 16, 1945. Middle photo: New Yorker Julius Weissman and Rosa Kampler marry under a Jewish canopy in Naples, Italy, in June 1946. 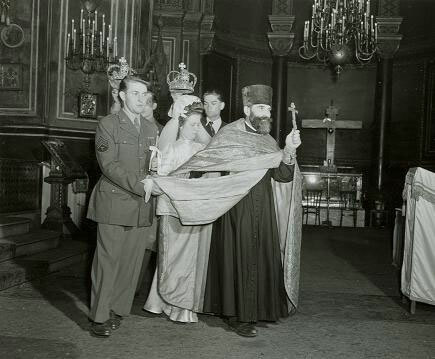 Bottom photo: Herbert Moody of Richmond, Virginia, weds Valentine Smirnoff in Paris's Russian Orthodox cathedral in June 1945.